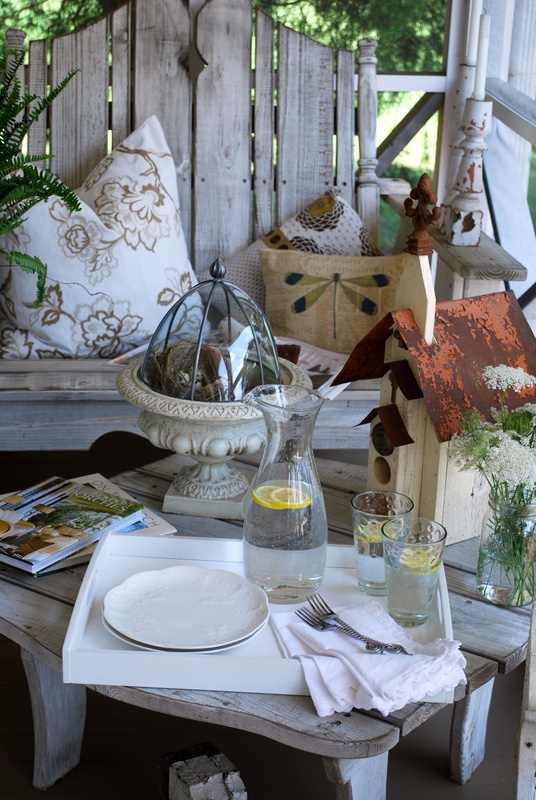 I’m welcoming summer with whites on the porch! If June’s weather is any indication, we’re in for a hot, humid summer! In anticipation, I’m surrounding myself with whites, to stay cool, at least psychologically, on the porch. I’ve been busy with some household projects the past several weeks and no time to play with my camera, so I reached into the archives for this post to welcome summer! Originally from July of 2010, temperatures were the same as this June, in the mid 90’s with humidity to match. unlike the other end of the porch that faces west. with a few favorite things. 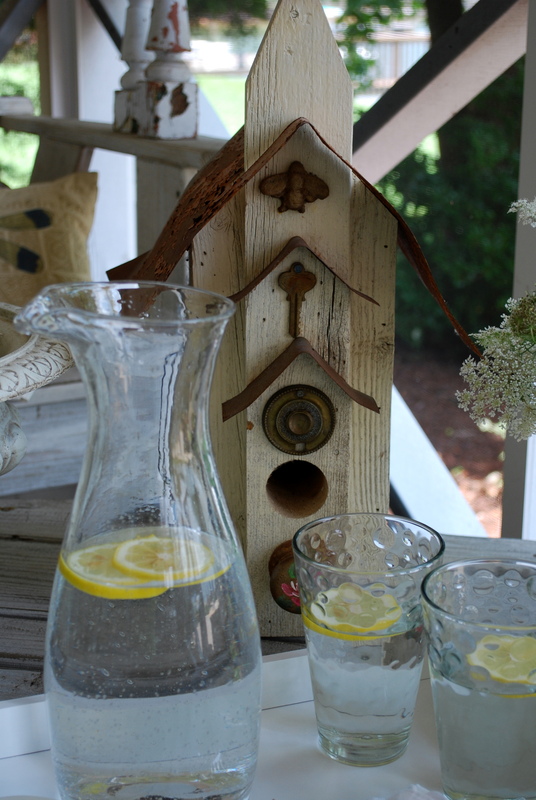 . .
A favorite birdhouse. . .
A well-designed porch is like a welcoming committee that invites friends and family to share stories, catch up on neighborhood news, or quietly enjoy the breezes of a sultry summer evening. Porches bridge our public and private worlds, and convey the essence of one’s home. In more than 250 stunning photographs of forty homes, Perfect Porches illustrates how varied these iconic American spaces can be. A wealth of structural appointments are presented, such as the extended eaves of a rain porch along the Gulf Coast, the shimmering copper flooring of a converted Amish cattle barn in Bluegrass country, and Outback-inspired painted thresholds in California’s wine region. Whether you seek to reawaken a cherished memory of a childhood porch, create an adorned haven of your own, or take an enlightening journey across the nation, this volume is certain to become a treasured companion as well as a source of fresh inspiration. Very pretty and inviting. Can I come sit with you on the cool side of the porch? I was really hoping after the bitter cold winter we had, that it might be a cooler summer so we could enjoy the outside more, but it has been hot and humid here too. So – maybe not. Either way, I’m sure we’ll find a way to enjoy our porches every chance we get. How inviting, Mary!! Makes me want to kick off my sandals & curl up with that book…which, btw, I’m ordering shortly. Thanks for telling us about it & for the inspiring ideas….just beautiful, as always. Hi, Mary! This just makes me want to sit down in the shade and sip lemon water. Lovely! I loved seeing this post again, Mary. I always enjoy getting a glimpse of your beautiful bench. Is your porch in the book ’cause it’s perfect! Mary: Your pictures always inspire me & today’s blog is no exception! I have a wonderful screened in porch here in Arizona, where we must think cool in the summer….with all our dry heat! Love Queen Anne’s Lace…When I lived on the mainland I would drive the back roads looking for blooms to mix with blue hydrangeas and multi-colored hued day lilies…Have always loved that combination…! How nice to have a pretty spot that’s in the shade all day Mary! I was debating about moving my garden swing under the carport but then realized it would be in the sun after work in that spot too!!! Oh well, my ceiling fans work well:@) Happy Summer! I loved reading this post about porches. I can remember my Aunt’s home in Virginia with her big front porch and all the lovely ferns and plants she had on it. After dinner and everything was cleaned up in the kitchen we would sit on the front porch until dark. People walking by and saying hello …. What great memories. Your porch looks so inviting and comfortable. Thanks so much for sharing. Happy Summer. 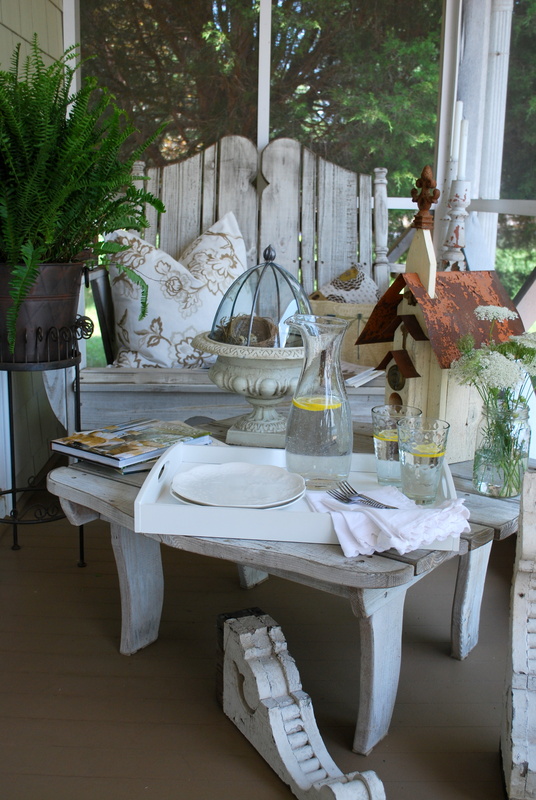 Just thinking – this lovely porch needs a sweet kitty or dog to complete the ambiance! Do you have a pet? Lovely whites Mary, and it is cooling~we have been sweltering this weekend, a little too early in the summer for all this heat! Let’s hope we both get some afternoon storms to cool things off~I am making note of that porch book to peruse when I have a little more time, it looks wonderful! 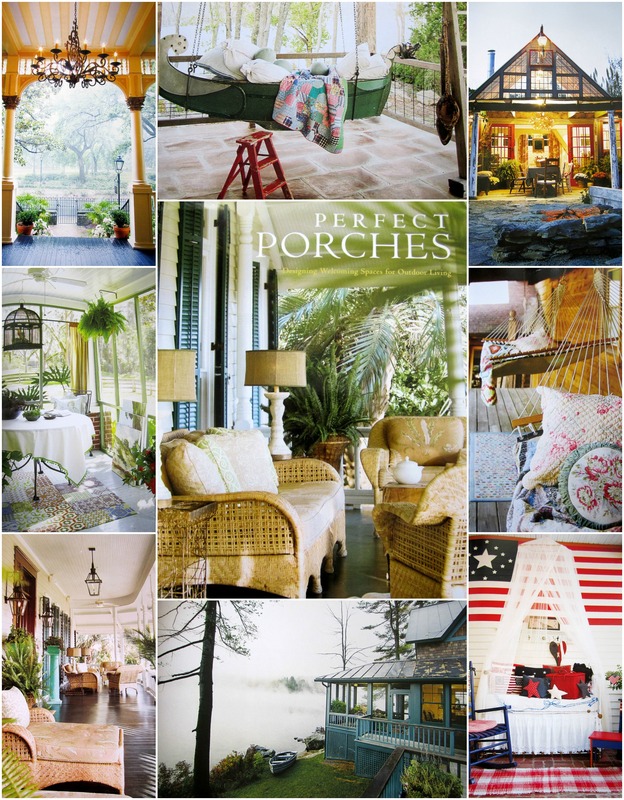 The more I see your photos and those like in the book “Perfect Porches”, the more I want a front and/or side porch!!! They just look so cool! 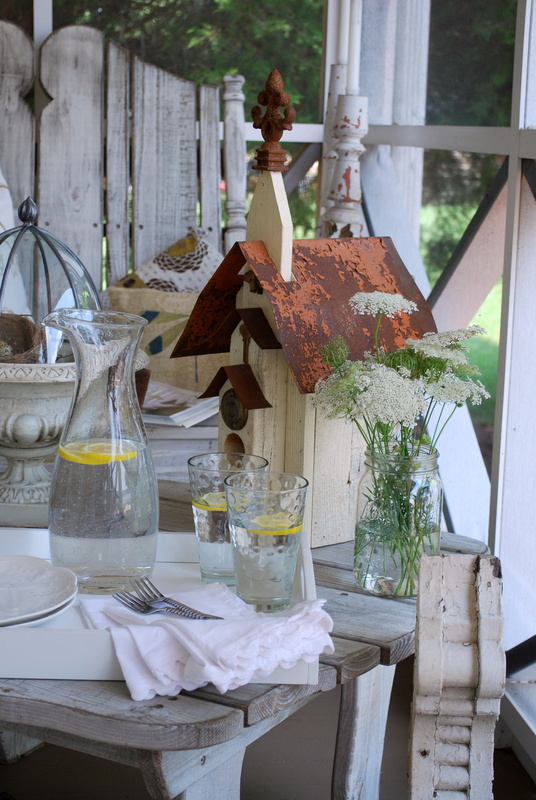 And you’re right…the more white on a porch in summer, the cooler and more inviting it appears! I always love seeing your porch. I miss mine SO much! The whites are so refreshing for summer. We just got home from OBX for a week so I am trying to catch up on my favorite blogs. 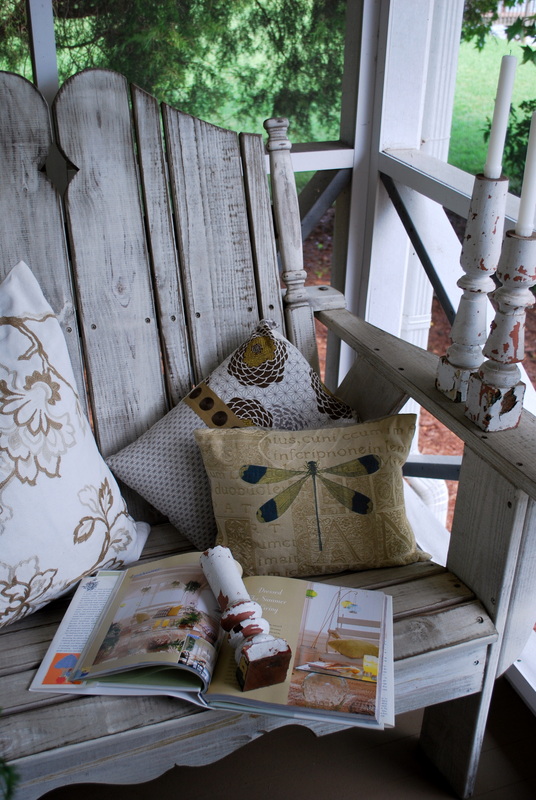 I love seeing your porches whether it being the porch of the house or the porch of the garden shed…the white color scheme is so relaxing and sure to make you want to sit and while and enjoy a good book…like the Perfect Porches book that I need to check out! !….Hope all is going well for you!!! I have long admired that oversized chair or settee on your porch … would you mind sharing your source? Yours is truly magazine worthy! This absolutely makes me want to sit down and relax with a book. So welcoming! Love the fork and the delicate napkins. So many nice details. So fresh, clean, crisp, and relaxing…love this setting! 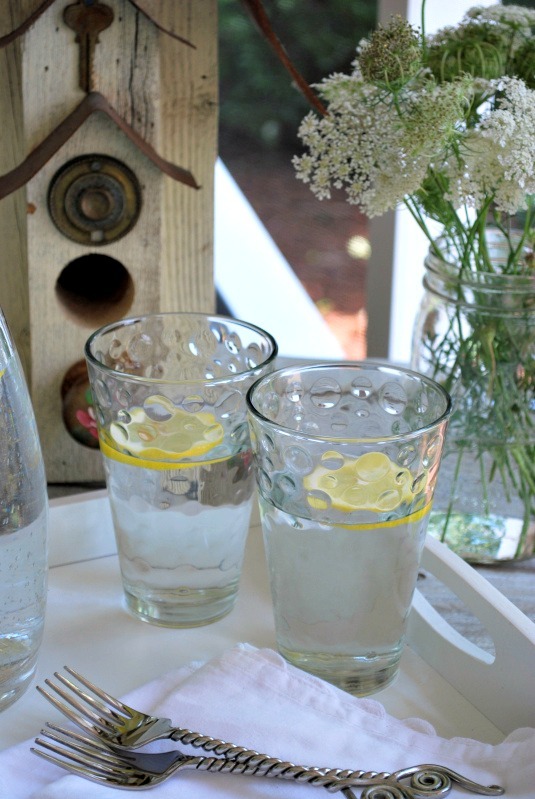 I love the water pitcher and glasses. Do you mind if I ask where you got them? I would love to sit down right here and read all day long while sipping lemon water, too. 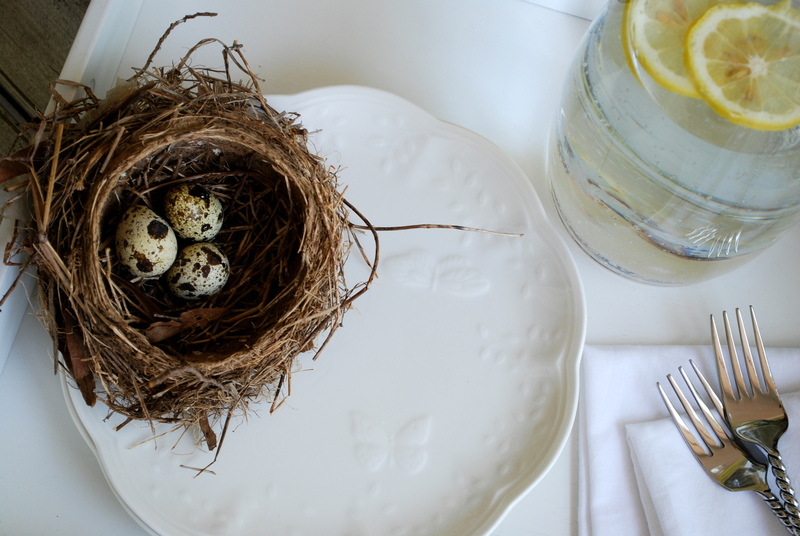 Your decorating style is so beautiful! Mary, I could sit on your porch all day relaxing and reading your delightful books. I have been away from blogland for a few weeks and I have missed it. Glad to get back in the swing.